Buffalo grass still grows wild on the western prairies of the U.S. and has become a true rags to riches lawn grass variety. Originating in the United States on the prairies of the Western Plains, it was given the name “Buffalo Grass” because it grew under the feet of millions of American bison, often referred to as buffalo. The thickly matted grass was cut and used as sod for home constructions by early prairie settlers. Since those days, this grass has been fine-tuned with new varieties that make beautiful lawn grasses. Regardless of the variety, buffalo grass will maintain much of its original qualities that allowed it to survive on the prairies. A warm season perennial grass, it is best known as a drought and heat resistance grass. People love it because of its low water usage and low growth habit. Some newer varieties won't grow taller than 6 to 8 inches. Older varieties, like those in the photo, will have the characteristic seed heads buffalo grass is known for. This is a drawback for some, but the newer turf varieties have less visible seeds and make a more attractive grass. However, most varieties can not tolerate areas that receive abundant rainfall. This is important to know before planting buffalo grass. Please do your research first because the seed and sod is quite expensive. A special note to our Australian friends: The type of grass that Aussies refer to as Buffalograss is a completely different grass type than what is referenced on this page. What Australians refer to as Buffalograss is called St. Augustinegrass in the U.S.
All buffalo grass varieties spread by the production of stolons. Stolons are above ground stems that grow horizontally along the ground and root at the nodes forming new plants. Buffalo grasses are dioecious- meaning they have male and female flowers that become the seed. Male plants form on long stalks and are impossible to miss. It is the first thing you notice with buffalo grass. Some people find the stalks objectionable. The female seed is hidden farther down in the grass. Varieties developed from the female plants will generally produce grass without visible stalks. The female varieties cannot be started from seed and must be planted as plugs or sod. It is the more sought after turf for home lawns. Native grasses and the older cultivars are gray-green to blue-green in color. Their low density makes the older varieties less desirable for home lawns. Maximum growing height is about 8 to 12 inches and are used primarily as forage grass, ground cover for right of ways and hill sides, and as a prairie grass. Water Conservation: Buffalo grass is well-known as a drought resistant grass species. Without water it will survive drought during the summer by going dormant and revive as soon as there is sufficient moisture. However, if you desire a green lawn all summer it will need to be irrigated regularly. Low Fertility Requirement: In addition to its water conservation qualities, it has a low fertility requirement. Mature grass requires only 1 to 2 lbs of Nitrogen per 1000 sq.ft. each year. Compare this to tall fescue or Kentucky bluegrass that requires four to six lbs of Nitrogen each year. Low Growing: Buffalo grass, depending on the variety, will have a maximum height of 3 to 8 inches. Few Insect Problems: Very few insects are known to bother buffalo grass, although chinch bug can be a problem for some varieties. Buffalo grass strongly prefers drier climates. Short growing season in the northern ranges. Older varieties are less dense with numerous seed heads that are unattractive to some people. The main disadvantage is that its adaptation range is somewhat limited. The grass originated in the drier climate of the Great Plains states and will do best in areas with similar conditions. Therefore, its primary range will be in the western states starting in West Texas to California to the southern portions of Western Canadian Provinces. Moderate to high rainfall areas are generally not compatible with most varieties. The growing season is somewhat short, especially for northern regions. It survives the cold by going dormant. Southern varieties that remain green longer into the fall are not as adapted for colder regions and will suffer winter damage. Varieties developed to go dormant more quickly into the fall have better cold tolerance and survive winters better. It still remains that buffalo grass, even the turf-types will not become as thick as some other grasses. If you are looking to have a grass as thick as zoysia, for example, you should probably not choose buffalograss. Different varieties will have different adaptation ranges, turf quality and appearance. Some varieties can handle the extremely cold weather of the northern plains and even into Canada. Others cannot. The best advice is to be sure you know how a variety will perform where you live to save yourself troubles down the road. Check with your County Extension Office for help choosing the best grass for your location. Turf-type buffalo grass is fairly new to the market and research is still ongoing. The most recent varieties of buffalo grass can be considered a high quality lawn grass. Depending on the variety, colors will vary from gray-green to very dark green. Some were developed as a sports turf, including golf greens, while others were specifically developed as a high quality lawn grass. Below are a few of the most popular varieties. "Texoka", "Sharp’s Improved", and "Bison" Varieties: While these are improved seeded varieties, they are best suited for roadsides, right of ways, and as ground cover. They are not the best choices for lawns. They will not form the thick turf that most homeowners expect. This was the first Buffalo Grass released as a true "turf grass" variety. It forms a beautiful blue-green turf. Many of the qualities are found in other varieties as well. Below are more Prairie characteristics. Prairie buffalo grass is a female plant that must be purchased as sod or plugs. It is best suited for home lawns and recreational areas and has fine, short leaf blades. This variety forms a medium dense turf, will spread quickly and has good wear resistance. Prairie is suited for drier, heat prone areas from South Texas to the mid-Great Plains states. It may suffer winter damage in the coldest regions of the U.S.
Due to a low growth habit this grass requires less mowing, less water, and less nutrients than most other types of lawn grasses. Does well in clay soils and prefers neutral to slightly alkaline pH. Grows best in full sun and does not do well in shade. The variety called 609 is an improved variety that makes a beautiful lawn. It was once the top buffalo grass variety, but other varieties have now surpassed it. It is used on golf courses to home lawns. It has many of the qualities of Prairie. Established vegetatively by sod or plugs. Cannot be established by seed. Beautiful blue-green turf. However, it is a darker green that earlier cultivars. Forms a low growing, medium thick turf with fine blades. Low water consumption on mature turf. Adapted for southern regions from South Texas to the lower Great Plains states. Can Suffer winter damage in the Northern Great Plains States. Does well in clay soil or soil with neutral or alkaline pH. Much the same as 609 variety except 315 is better adapted for the colder northern states. Turf quality may be slightly better than 609. MoBuff is a female variety that must be started vegetavively. Faster green-up in spring than other warm season grasses, including some varieties of Buffalo grass, Bermudagrass and Zoysia. MoBuff holds the "longest cold-hardiness record in Central Missouri of any major Buffalo grass variety". MoBuff, like most other varieties, is best suited for arid or semi-arid climates. Even though it was developed in Missouri to survive Missouri winters, Missouri can get a lot of rain and the grass tends to decline in wet years. Important Note on MoBuff: The rights to MoBuff was purchased by Clark Brothers Seed Company in Clinton, MO. However, Clark Brothers is no longer in business, therefore, MoBuff is not currently in production. Maybe someone will purchase the rights and produce MoBuff again. Legacy has established the current top variety in northern states and southern Canada. It forms a thick, beautiful, dark blue-green turf. Below are more advantages of Legacy buffalo grass. One of the more beautiful buffalo grass varieties. Adapted to grow in drier climates from Northern Oklahoma to Southern Canada. However, it will perform best in the northern Great Plains states and other places of equal temperature and environmental conditions. Legacy has exceptionally good cold tolerance. Fast spreading, stoloniferous growth habit. Grows to a height of 4 to 6 inches. Prefers sunny locations, but will spread slowly into light shade. Can tolerate clay soils and prefers neutral to alkaline soils. Starts vegetatively, Prestige is the current benchmark for southern lawns. Prestige is similar to Legacy, (described above) but is slightly darker green in color. Its very fine, soft blades make an excellent lawn. Best adapted for lawns in southern and southeastern states, it will likely suffer winter damage in northern locations. Prestige will grow to a height of 4 to 6 inches. Buffalo grass is well-known for its low nitrogen requirement. Mature grasses do well with two or three fertilizations of no more than 1 to 2 lbs nitrogen per year per 1000 sq. ft. However, newly seeded lawns or grass just starting from plugs will need slightly more until it becomes established. Lawns that are fertilized with 2 lbs will be thicker than those using only 1 lb of nitrogen. Click on the link for help understanding the numbers on a fertilizer bag and calculating fertilizer rates. Low maintenance areas can be fertilized with one pound of nitrogen at green up in the spring. For high maintenance sports turf or for the best lawn quality, you should apply a second application in mid summer. Use a slow release summer fertilizer. Organics are great for buffalo grass because of its slow release nitrogen and generally low nutrient content making if more difficult to over fertilize. In addition, most organic forms of fertilizer have a low burn potential and do not have to be watered in after application. Over-fertilizing buffalo grass is well-known to weaken the plant causing it to decline. It is the same with over-watering. It is best to avoid the common mistake of thinking more is better when applying fertilizer. The newest varieties form a thick turf, but older varieties tend to be less dense, so you can expect a certain level of weed problems. It is important to try to keep the weeds down until the grass thickens and matures. Application of a preemergent to prevent undesirable lawn grass seed and weed seeds from germinating is advised when starting from plugs. Do not use a preemergent if you are starting your lawn from seed or it can keep your buffalo grass seed from germinating. Post emergent broadleaf weed control can be used after the first cutting or as directed on the herbicide label. Buffalo grass is a low water user that requires approximately .25 (1/4) to .5 (1/2) inch of water each week. Its water requirement is one third to one half that of other lawn grasses. In fact, over-watering will actually cause the grass to decline. On the down side, its low water requirement can limit the adaptation range of this native species. Areas that receive more than 25 to 30 inches of rain each year may begin to see a decline in density. Some varieties may tolerate more water than others. Excessive moisture over a period of time may actually kill the grass. However, for these very reasons, buffalo grass is a perfect match for drier climates. Before starting a lawn from buffalo grass seed, it is best to prepare the soil first. Use this time to correct any soil or nutrient problems as stated on a soil test. Keep in mind that older varieties do not produce a thick turf that many homeowners are looking for. However, if your goal is to restore native grasses to your property, you should be fine. If you want to completely change over to a buffalo grass lawn you will need to kill all the existing grass first. Products such as Rodeo or Round-up are non-selective and kill all the grass it comes in contact with. Hillsides are more challenging to establish quality grass. It is not always advisable to kill the current grass first on hillsides before planting. Bare soil is more susceptible to erosion. Do not overseed buffalo grass with a cool season grass in the fall. Spread from 1 to 6 lbs of seed in most situations depending on the variety, its use, and how quickly you would like it to fill in. Only about 1 to 2 lbs per 1000 sq. ft. are needed on hillsides. It may take a few years, possibly overseeding each year, to establish a good stand of buffalo grass. For lawns, spread 4 to 6 lb per 1000 sq. ft. The buffalo grass seeds will need to be covered with ½ inch of soil for best results. It is okay to apply a starter fertilizer at the time of seeding, but do not use a fertilizer that includes a pre-emergent. It will prevent your lawn seed from germinating. For sod, prepare and level the soil. Make sure you pick up any rocks, sticks, or other material before the sod is put down. Lay down sod carefully and use a lawn roller to help sod make good contact with the soil. Until the roots on the sod start to grow, the sod will only receive water you give it, unless it rains. It is important to water lightly and frequently until the roots start to penetrate the soil. When this happens cut back on the frequency of watering, but irrigate deeply to promote deeper reaching roots. If using plugs, place plugs in rows on 1 ft. centers being sure the roots are well covered with soil. 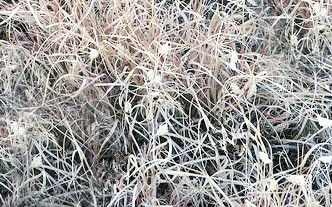 The grass will begin spreading by producing stolons that reach out in all directions. It is recommended that you use a fertilizer with a pre-emergent mixed in after all the plugs have been placed. The preemergent will help keep wild grass seeds from germinating while the grass thickens. Be sure to water the plugs thoroughly. For the first couple of weeks until the roots develop further, make sure the soil doesn’t dry out too much, especially in high temperatures. Apply a slow release fertilizer equaling approximately one pound of nitrogen per 1000 sq. ft. For help understanding and applying the correct fertilizer amount, see Lawn Care Academy's Fertilizer Section. A great thing about buffalo grass is that it requires less mowing than many other grasses. The maximum height for several turf varieties are in the 4 to 6 inches range, which means it is less likely to ever get out of hand. This means you will not have to mow but twice a month. You can take a longer vacation and not worry. Sports turf varieties can handle low mowing down to 1/2 inch. These varieties are not recommended for home lawn. It takes experience and special equipment to prepare the soil so it is perfectly level and rock free. At only 1/2 inch tall even small rocks will become serious problems for mowers. Most home lawns will do well at mowing heights of two or more inches. In addition, grass that is maintained at higher mowing heights develop deeper roots than low cut grass. Deeper roots are better able to handle heat and drought stress and require less frequent irrigation. Brown patch is a late spring and summer disease. It requires temperatures above 80 degrees and high moisture to activate the disease. Areas of high humidity will experience the most problems. Try to refrain from watering in the late evening or at night where soils can remain damp all night. The disease appears as semi-circular patches of dead or dying grass. The center of older patches may recover giving the patch a frog-eyed appearance. Close examination of the grass blades will reveal tan colored, irregularly shaped spots with purple margins. The disease usually remains active as long as the environmental conditions continue, especially the humidity. If the humidity and temperature drops the disease progression will usually stop. Nitrogen in fertilizer will only fuel the disease. Avoid fertilizer applications if you suspect the disease and be careful not to over-fertilizer early in the season. Summer Patch is a disease that affects the grass roots and crown. During hot, wet weather, if the disease pathogen is present, the grass can begin showing symptoms. Symptoms first appear as small circular patches of yellow-green to tan colored grass a couple inches in diameter. The patches may grow to a foot or more in diameter. As the disease patches enlarge they will often blend forming even larger patches. Like Brown Patch, the center of older diseased patches may recover giving it a frog-eyed appearance. The roots and crown of diseased plants are often dark. If environmental conditions remain, the roots and crowns of the grass will eventually die and rot. At this point the affected grass cannot be saved and it will die. Summer patch is worsened in high pH soils. The soil pH in western states tend to be higher. You should be especially watchful for signs Summer Patch disease. If you have had problems with Summer Patch before, do not apply any fertilizer during the late spring and summer months when the disease threat is highest. Applying excessive amounts of nitrogen can fuel the disease once it begins. Try to be accurate in the amount of fertilizer you apply. Click on the link for photos, signs and symptoms of Summer Patch and other Hot Weather Diseases . Leaf Spot, formerly known as Helminthosporium Leaf Spot, is a cool, wet weather disease that begins in the grass blades. As the disease progresses it can move toward the grass crown, which initiates the second half of the disease- the melting out phase (crown and root rot). The disease symptoms begins as tiny brown or black spots on the grass blades. The spots become larger as the disease progresses. The larger spots have tan centers with a purple to black border. Several spots will coalesce causing the blade to wilt and die back. The melting out phase will be a browning of the crowns and stolons that will eventually kill the grass. Fortunately, disease progression usually stops as soon as environmental conditions that promoted the disease changes. An increase in temperature with drier conditions will usually be enough to stop the disease. If you suspect the disease avoid evening and night watering or frequent daytime watering. Instead, water deeply and less frequently. Avoid applications of quick release nitrogen fertilizers. Click here for photos and help in diagnosing Cool Weather Diseases. Buffalo grass is not bothered by many insects. Probably the most frequent damage will be from chinch bugs. Chinch bugs pierce the leaf blade and feed on the plant's juices. While feeding, they inject toxins into the plant. These toxins are actually what causes the most damage. Damage from chinch bugs usually begins during hot, dry conditions. Damaged grass will turn yellow and then brown. Chinch bug nymphs are red with a white band, later turning orange and then black with white spots on adults. Adults are approximately 1/10 of an inch long. Reducing the amount of thatch may help control chinch bugs. Apply an insecticide containing the active ingredient "bifenthrin" or look for other products labeled for chinch bug control. Zoysia grass was imported from the Orient and has become one of the leading warm season grasses in the U.S. Click here to learn about this beautiful grass and tips on how to care for it. St Augustine grass is a favorite hot weather grass adapted to the coastal and southern regions of the U.S. from Florida to central Texas. Click here for information on growth habits, maintenance and lawn care tips. Centipede grass is a low maintenance, low fertility and slow growing turf grass that is adapted to the southern coastal regions of the U.S. Click here for detailed information on how to plant and care for this grass. Bermudagrass is the most popular warm season grass in America. Read about the pros and cons of planting this grass, along with all you need to know to take care of your lawn. This pages is your starting point to many of the most popular cool season grasses, along with growth habits, fertilization, and more. Why is fertilizer important? This page answers that question and describes the basics of grass decline when left unfertilized. It also offers alternative steps for maintaining a healthy lawn. Complete instructions and techniques for overseeding lawns. Bermudagrass is the most frequently overseeded warm season grass. Find out how to do this as well along with the types of seed you can use.